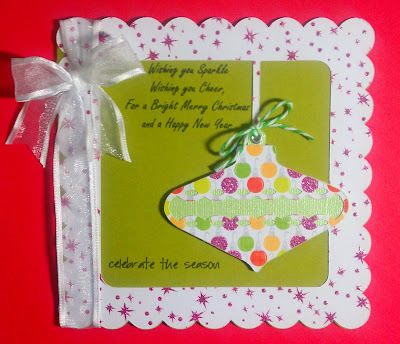 Today Chef Felicia is featuring cards and tags she made using the Cricut Art Philosophy cartridge. It contains a wealth of fun, versatile, fundamental shapes you'll use on dozens of different projects. Images include cards, tags, borders, font, 3D items, dimensional flowers and more. 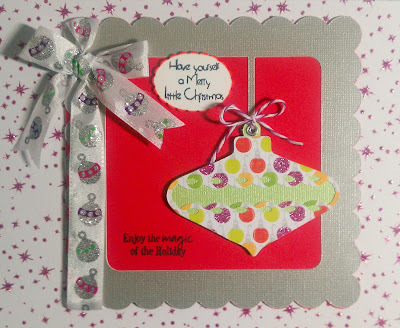 Many of the images perfectly coordinate with a selection of Close To My Heart My Acrylix stamps to make stamped projects faster, simpler, and easier. And with 700 images you are sure to use this cartridge a lot! The cartridge is available only through Close To My Heart Independent Consultants and is sold as a collection that also includes three exclusive stamp sets and three Dimensional Elements chipboard sheets designed to coordinate with cartridge images. So without further ado . . . here's Felicia! Hi, everyone! I must admit that when I first went through this cartridge, I immediately thought of Christmas. This cartridge is a definite must-have for your Cricut Collection. It can serve so many purposes for several different occasions, all in one. I can't say enough about it! So journey with me as I share a few of the many cuts I found interesting to do. I really love the card feature on this cartridge and couldn't help but thinking, yes I want to do a window-mock card. The cards are so easy to follow. I used several different papers and the stamp on this one is from PBD - Christmas Wishes. This card feature really had me pushing it beyond the norm of its design. 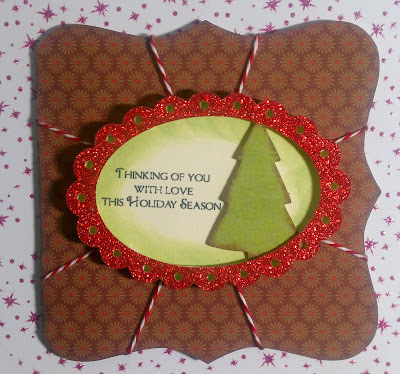 I pop-dotted the frame on the background to make the look of the Tree in a window. The sentiment is from PBD-"Christmas Wishes". I did some distressing to the inside frame, also with the tree. This is my favorite and I will definitely be making more of these. Similar to card one, I loved the play on this card and giving it more sparkle with the choice of papers. I'm telling you . . . this cartidge will be getting a good work out! There are several more card features to enjoy on it. The sentiment is from PBD - Christmas Wishes. 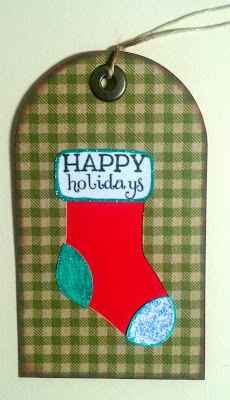 I love this simple, yet cute tag. The tag features are AWESOME! The sentiment is from MPS - Winter Punnies. I did some distressing on the edges. I cut out the snowflake, distressed it a little then added some Martha Stewart glitter to sparkle it up. Who can think of Christmas without hanging a stocking! This too was simple to assemble. This cart has it all and the layers are so easy. Mass producing these for your Christmas gifts would not be a problem at all. The sentiment is from MCT - All Around Christmas. 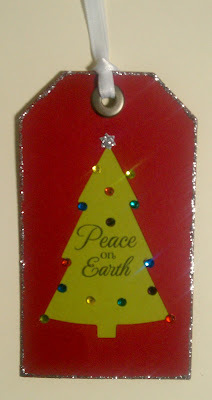 I couldn't help but give this some sparkle too with Stickles and Martha Stewart glitter pens. O Christmas Tree, O Christmas Tree, How lovely are thy colors. This one I think is my favorite of the tags. I used my iRock to glue the colored gems as the decor for the tree and some Stickles on the star. The sentiment is from MCT - All Around Christmas. If you don't have this cart, I suggest you RUN . . . don't walk! Using this cart was so much fun, I couldn't stop cutting. I want to try out every cut and I've never said that before about any cart. This will certainly be getting me through my Christmas projects this year. Hope you enjoyed this showcase. If you need a Close To My Heart Rep. Please consider using my dear friend Pat Polit. She is such a sweet lady and I have known her for several years. She is a wonderful Woman of God and will take care of all your needs!!!! for the cart purchase through Pat. Awesome job, Felicia! You have definitely given us some Christmas spirit! Make sure you join us Monday when Chef Mindy showcases the Something to Celebrate cartridge. Felicia, Thank you so much for the wonderful inspiration and post! Love..LOVE...LOVE the projects! FAB-E-LOUS job girl!!!! Beautiful projects - thank you for sharing! Wonderful! I cant wait to get mine! These are beautiful! Love the gift tags!! I have to say that the Art Philosophy Cartridge is one of my favorites! Great job! !